The author. Matt Gross, for four years wrote a regular column for the Times, called The Frugal Traveler having visited nearly two hundred countries around the globe. So he’s certainly a person with a lot of travel experience, and he’s likely set foot into more churches, synagogues, mosques, and temples world-wide than most globe trotters—after all he’s the Frugal traveler. And here in Jerusalem (a city know by the proliferation of religious places), he refers to Redeemer as his favorite. It’s a nice little travelogue and you can click on it here: Lost in Jerusalem (aka My favorite place). An interesting aspect of this story that Gross shares with the reader in the first paragraphs is that he considers himself a “deeply’” secular Jew from Brooklyn who never wanted to visit Israel. Yet last December, at the encouragement of a friend, he made his first trip, all the while thinking of himself as the “lone unbeliever” in a sea of religious people. Something about this church affected him so that he returned several times including a Sunday morning worship service. And so his final verdict: my favorite place in Jerusalem. For those of us who consider Redeemer “home,” this it quite the compliment. It lead us to reflect a bit about the many visitors who come our way, those who show up on a single Sunday to attend worship and those who drop by during the week to say a prayer, to gaze at architectural beauty, or to pause for a moment of silence making connections between these myriads of physical stones and that which continues to remain unseen. The first thing that strikes us is, as realtors often say, location, location, location. 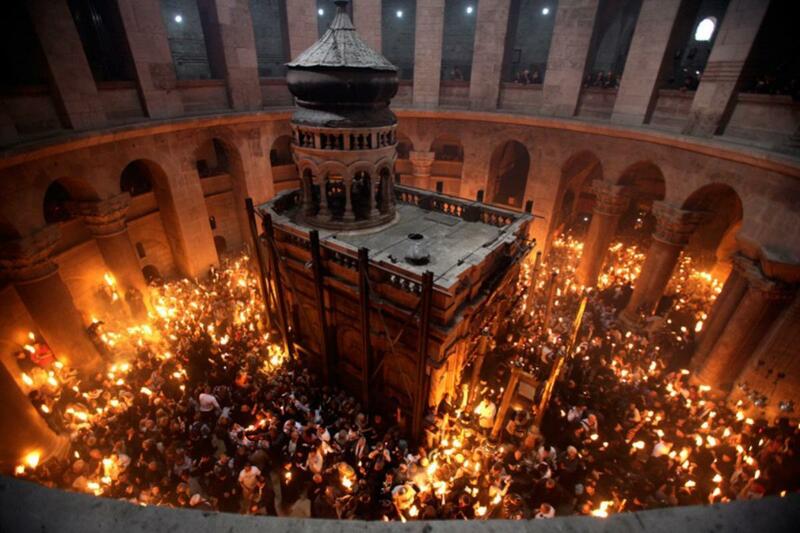 Celebration of Holy Fire at Orthodox Easter at Tomb of Jesus. In the photo we use as the header for this website, the two domes just to the west of Redeemer are over ancient Golgotha and the tomb. Sometimes we have to pinch ourselves as a reminder that here in the heart of old city Jerusalem, just a stone’s throw away of the Church of the Holy Sepulcher, the empty tomb, and the Via Dolorosa, stands a magnificent Lutheran Church. Even among Lutheran visitors, probably only a third are cognizant of this fact before they come, another third are pleasantly surprised, and another third pass by our doors without even realizing who we are. Yet it is because of the location that so many folks stumble upon us unexpectedly—people from all walks of life, from all corners of the earth, and from every faith expression whether counting themselves among the faithful or the skeptical. And in contrast to the gathering of crowds in the nearby well-known ancient churches and the busy streets and markets, Redeemer is not on the itinerary of most tour guides. As a result, it is a comparatively quiet place, attractive for those who want a moment alone. A second observation from our time here is that Redeemer is appealing to many because of its simplicity. Gross describes the main sanctuary as both “elegant and spare” with tall pillars and graceful curves. The main sanctuary was constructed in 1898 under the direction of Kaiser Wilhelm and German architects in a Neo-Romanesque style and the ubiquitous Jerusalem limestone. Those cold grey stones are windows to a vastness of thoughts and ideas. Most visitors don’t realize it, but the walls were once covered in paint, but in restorations following the shelling in the 1967 war, the color was all stripped away except for a small circular Christus Rex in the upper apse. Redeemer offers regular organ recitals and concerts for string ensembles on Saturday nights. By far the largest number of attendees are Israelis who venture into the old city for this blend of music and architecture. It is very common for the groups that I meet to express an appreciation for this lack of decoration. The ornate styles of the Middle East are something that westerners grow to appreciate only over time. The simple cold stone has a calming affect and is inducive to reflection. The same goes for the worship space of the English Congregation, our smaller St. John’s Chapel restored from the 12th century hospital refectory. The less-than-perfect rugged stone work remains bare, yet hinting of an ancient archway here or the beginning of a stairway there, and a blocked passage-way in the wall behind the altar. Such architecture often transports one’s thoughts to earlier times and that great cloud of witnesses that spans the centuries. It is not unusual to find a solitary figure sitting in quiet meditation in either of our places of worship. The doors are open throughout the week. Most people come and go, no questions asked. Our purpose is not to intrude, to destroy a special moment. But sometimes someone lingers, like the Hebrew University student last February who missed her worshipping community back home, and who subsequently returned again and again. Sometimes one of our doormen offers an invitation or provides a bulletin with prayers and readings or further information. I had to smile last week when our Muslim custodian, Abu Muhammad, brought one such visitor to my office, “This is my pastor.” But often the visitors come quietly in wonder and anticipation and leave quietly with heads bowed. On Sunday mornings we have English-language services at 9:00 in the 12th-century chapel, while Arabic service are going on next door in the large sanctuary. Our goals are to be welcoming congregations. One of the exciting things about Sundays mornings is that we never know what to expect or whom to expect. We have our core group of regular members, some here on work, some for study, and many in volunteer capacities. Coming to Jerusalem on temporary assignment they keep their church membership back home, just as we continue to belong to our home congregation in Waverly, Iowa. 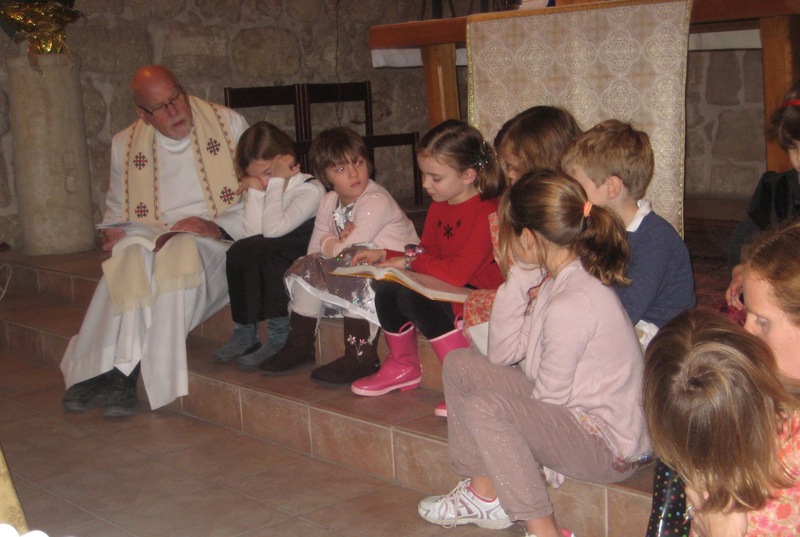 We use Evangelical Lutheran Worship in our services and we have Lutheran in our name. Yet we speak of ourselves also as International and Ecumenical with arms open to welcome all. A year ago with only one child in our Sunday School program, we decided to make children’s ministry a priority, and quickly discovered that this is a critical need for expatriate personnel with families. Through word of mouth we now count seventeen children among our children bringing new life and excitement to all. When we stepped back to evaluate what was taking place, the surprise that only one of these families has a Lutheran background. All are welcome. This is the nature of ministry in Jerusalem. We have fourteen ELCA Lutherans, and Lutherans from Norway, Sweden, and Finland actively involved in the life of the congregation, yet our church council at the end of the year included a member of the Free Church tradition in the States, a Mennonite, an English Baptist, a French Protestant, and just one Lutheran. We’re all here because we need our faith community. The majority of our worshippers on any given Sunday are one-time visitors, pilgrims, tourists, delegations, sometimes coming alone, and sometimes in larger groups. Occasionally we know in advance about a group. But most often it is a serendipitous surprise. At the end of the service we take time for introductions, no matter how long it takes. They too come from all over the world, and likely from every denomination. The last two Sundays we’ve had kipa-wearing rabbis in the congregation, coming with Christian colleagues on interfaith tours—going together to synagogue on Saturday and then coming together to our service on Sunday. All are welcome. 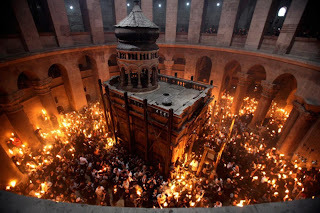 The Frugal Traveler mentioned in his travelogue that his several visits to the solitary quiet of Redeemer lured him back for a Sunday service, when the Arab congregation was gathered. He was impressed with the greeting at the door, “All the languages are in God’s light.” It didn’t matter that the woman behind him sang in a reedy voice, or that the kids were restless, or that the organist hit a few errant notes. This was his favorite place. 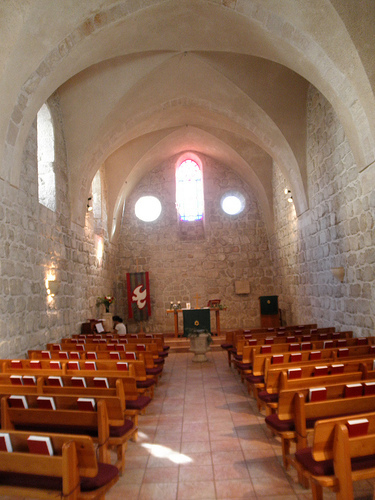 A welcoming church in Jerusalem is no different than welcoming churches in the States. The surprising line in this article was not so much that he mentioned Redeemer in glowing terms, but that he compared worship at Redeemer to an earlier experience visiting a church in Decorah, Iowa. That's Decorah, as in the small town just up the road a bit from our home. Naturally we wondered if perchance he had been a student at Luther College. But after researching his earlier blogs, we learned that The Frugal Traveler had just been driving across the midwest on a road trip for another column. There, stopping at a random eating establishment, he struck up a conversation with the owners who ended up inviting him into their home for three days, and also to attend church on Sunday morning. It’s the same with churches everywhere, Decorah, Iowa or Jerusalem. All are welcome.